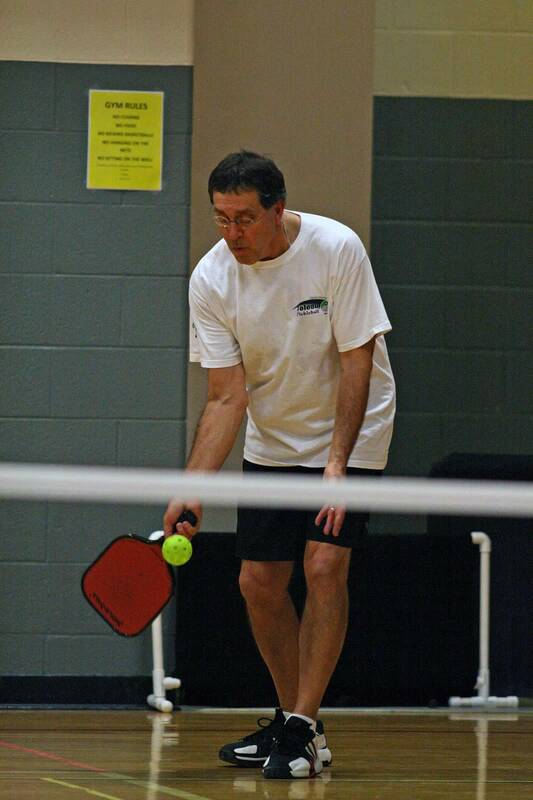 Rules/Strategy Review – Serving – Pickleball is Thriving in Northwest Ohio! The serve must be made with an underhand stroke so that contact with the ball is made below waist level. [Underhand defined] The arm must be moving in an upward arc and the paddle head must be below the wrist when it strikes the ball. Also, strike the ball as it is leaving your hand and avoid throwing the ball into the air as this adds difficulty to striking the ball accurately. Check out Bob Bernardo’s great serving form! The server must keep both feet behind the baseline during the serve with at least one foot on the court surface or ground at the time the ball is struck. The serve must be made while the server’s feet are within the confines of the serving court. These confines lie behind the serving court baseline and on or between the imaginary lines extended from the court centerline and each sideline. The ball must land in the opponent’s cross court (diagonally opposite court) service box. The serve must clear the net and the non-volley line and land in the opponent’s service court. The serve may land on any service court line except the non-volley zone line. Following the serving of the ball, the receiver must let the ball bounce before returning the serve. Then, the serving team must also let the returned serve bounce before playing it. After the two bounces have occurred, the ball may be volleyed or played off a bounce until a fault is made. Only the player served to may receive the serve, but should the ball touch, or be struck by his/her partner, the serving side scores a point. A serve striking the net and landing within the service court is called a “let” and another serve is justified and there is no limit to the number of times this can occur. NOTE: What is the rule if a served ball touches the net and then strikes the receiver’s partner before hitting the court? Is it a “let” ball or is the receiving team at fault and therefore loses the rally? The answer to this is in IFP Rule 4.F.3: The serve is a “let” and will be replayed if the served ball hits the net and strikes the receiver or the receiver’s partner. Service foot fault would be called if the server’s feet touch the baseline or area outside the imaginary extension of the sideline/centerline. In open play you need to watch your feet, however in a tournament the referee is responsible to call this. The most important thing you can do on your serve is to just get the ball in! Secondly, avoid the bad habit of stepping towards the net after you serve. The receiving team should be trying to return your serve back to you deep and to the baseline. If you get into the habit of stepping towards the net after you serve, you will be forced to take the return at your feet making it difficult for you to hit the ball strategically and keep it low. Try to make your normal serve land deep in the court. The deep serve is more likely to be missed or hit weakly than any other serve you can do. Once you can serve consistently and reasonably deep into the court, the next step is to develop your ability to serve the ball either to a player’s backhand or to their forehand. Once you can serve consistently with most serves landing close to where you aim, then you need to think about adding some variety to your serve. Your opponents are more likely to make mistakes when you give them a variety of serves. Mix it up! Vary the speed of the ball. Occasionally hit it extra hard. If you serve hard all the time, you will find that the other team will adjust and start getting the ball back every time. If you have normally been serving to their backhand, then throw in some occasional serves to their forehand, or vice versa. Try to keep them guessing. Many players will have a bit of trouble with a medium high serve to their backhand that bounces higher. That is because a high backhand is harder to hit for most people than a low backhand. Throw in an occasional very high, deep serve (like a lob). If it lands deep, many players will return it weakly because they don’t like the higher ball. Even some of the best players will hit it out or into the net because they try to return the ball with too much pace. Obviously, if they hit a power shot accurately, it will be more difficult for you or your partner to return. And keep in mind, any slower-paced serve is easier for your opponent to place, so you must be ready to cover the court. Next month I will be covering the return of serve. Also, if anyone has any specific part of the game they would like me to cover, please send me an email. Thanks I found it very helpful.